Beat the Black Triangle with Bonding! 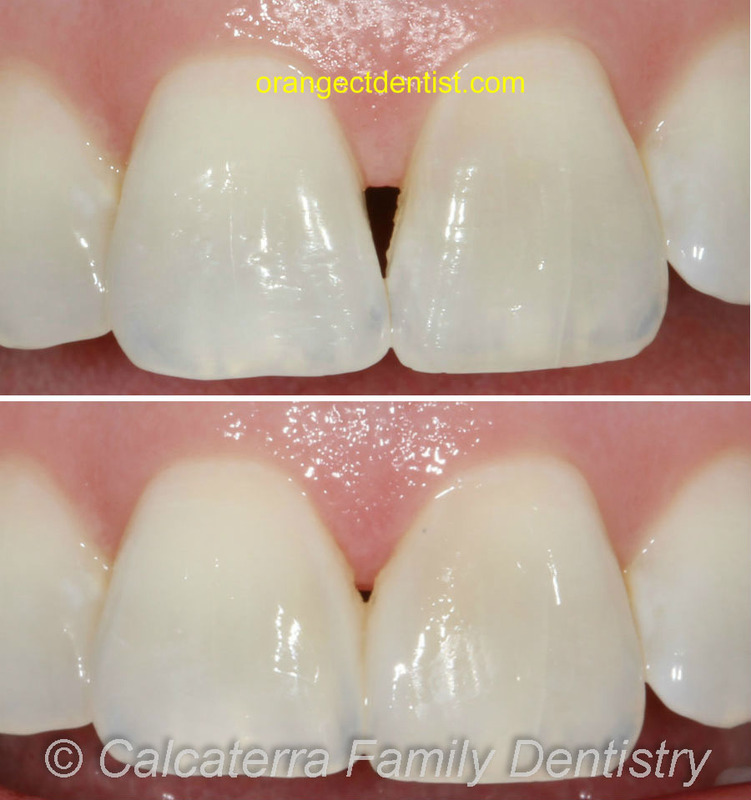 Black Triangle correction using dental bonding. The results speak for themselves! Case and photos by Dr. Nicholas Calcaterra. Clicking on the photo will show an even larger version. The patient above is a middle aged female in our practice. She was very self-conscious about her smile. She stated that for family photos, she would put her tongue behind her front teeth so that the black hole would not be visible. We discussed her options at length. 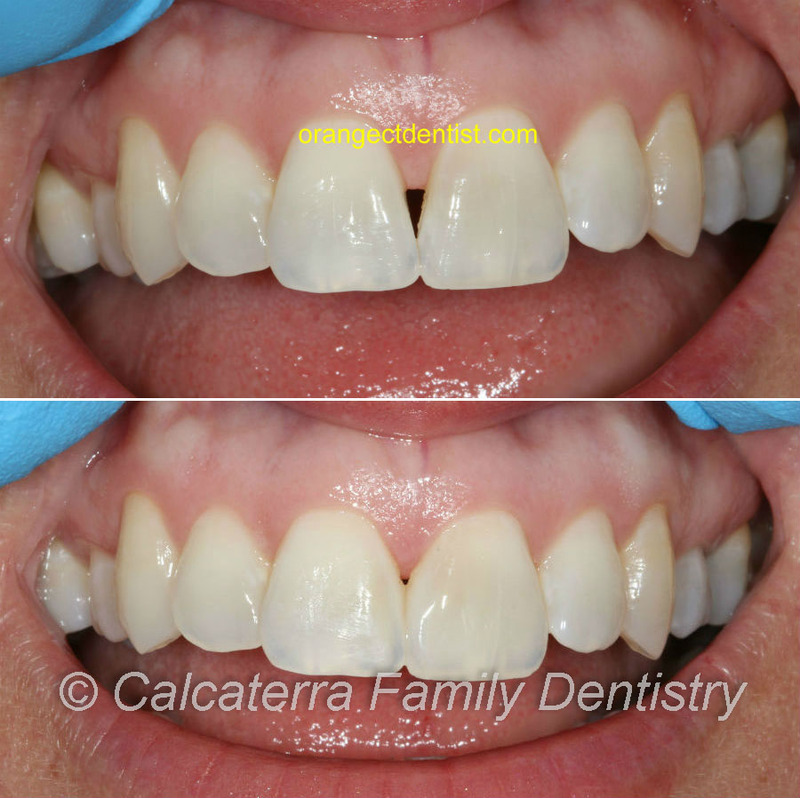 While porcelain veneers could have achieved an even better result, we collectively felt that option was overkill (too invasive and too costly). So we decided on bonding. We were able to achieve the above result in one hour and she left a changed woman! Greater likelihood of decay – because food is more likely to be chronically trapped there. Speech issues – air can escape through the gap(s) while speaking which can affect the pronunciation of certain sounds. Ejection of saliva while speaking – we’ve seen this happen on a couple of times but several patients have asked us to fix their embrasures over this very issue. Remember that not all open embrasures need treatment. And if you don’t want to treat them, that’s fine too! We’re very low key and we do not push treatment. However, we have helped many patients address these with either bonding, porcelain veneers, or all ceramic crowns with great results. Just ask our patient above! Contact us if you would like a consultation.